One of the most common diseases known to affect people of all age groups and more so women of the reproductive age group are Urinary Tract Infection. Urinary Tract Infection or UTI affects any part of the urinary tract starting from the urethra, ureter, bladder and kidneys! The symptoms that are suggestive of UTI are pelvic pain, painful urination, fever and traces of blood in urine. The UTI is often self-diagnosed by the patients and is usually recurrent and doesn’t last longer! One of the home remedies usually and commonly sorted by all is Cranberry juice. However a study was conducted and it has shown that cranberries juice offers no increased benefit, but cranberries capsule has some promising effect! The study involved 2 different group of people. One group received 2 cranberry juice capsules twice daily which is equivalent to 8 glasses of cranberry juice. The other group received placebo. The end result of the study was that people who received cranberry capsules were at about 50% reduced risk of developing UTI when compared to people who received placebo! 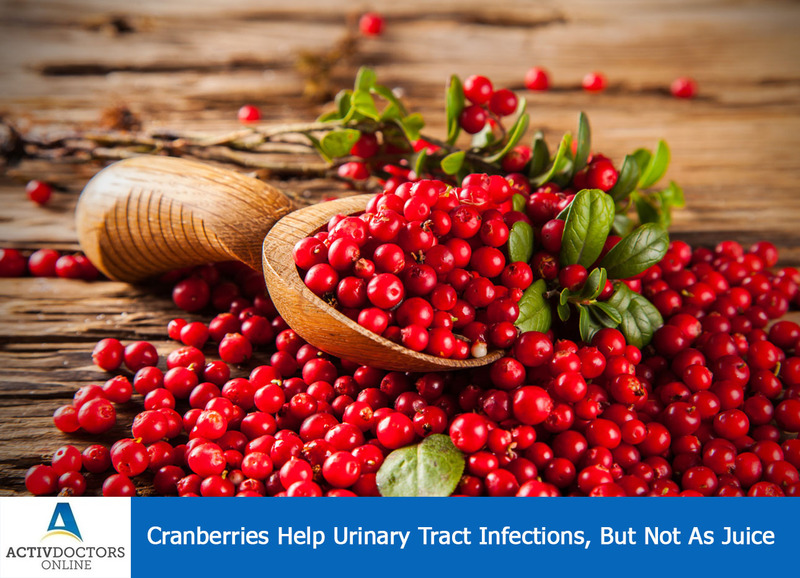 Cranberries were known to protect from UTI by interfering with the bacteria’s ability to adhere to the bladder wall with the help of A-type Proanthocyanidins present in cranberries. However, the juice did not serve the purpose or showed the benefit because the active ingredient is digested by the time it reaches the bladder thus reducing its disease protecting ability! Thus it is understood that cranberries help in UTI but not in the form of juice! This study shed a light on the reason behind cranberry juice being prescribed by a few doctors and not by all!! Adhere to your doctor’s advice and recover from being healthy! !